In 1992, Milwaukee artist John T. McCarthy, Jr. published a series of vivid Art Deco-style postcards called "Greetings from Milwaukee", celebrating iconic images of Milwaukee's past. ©1990 John T. McCarthy, Jr. 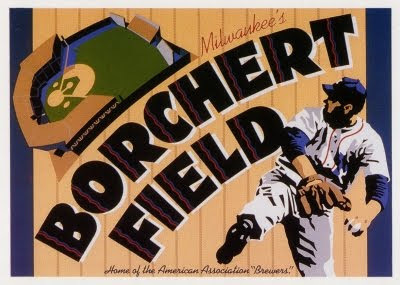 Many of these images, including "Ball Park (Field of Dreams)", were also offered as posters. The nameless pitcher pictured appears to be wearing a stylized version of the Brewers' classic early-1940s uniform, with the block "M" on his chest. The white cap logo would probably date it before 1942. It's not only a fun interpretation of the Orchard, but one which also holds a special place in the team's history. This postcard may well have been the first piece of Brews merchandise produced after the Braves moved to Milwaukee. In 1992, it would have introduced a whole new generation of baseball fans to the notion that Milwaukee's rich baseball history goes a lot farther back than 1953. John T McCarthy Jr recently spoke at the North Shore historical society about this Artistic Print series which includes Borchert Field & Country Stadium. It was very insightful! I hope to see him speak again at the Milwaukee Historical Society soon! When is he speaking? I'd love to talk to him about this series, and his own take on Milwaukee history. He's been hard to track down online. 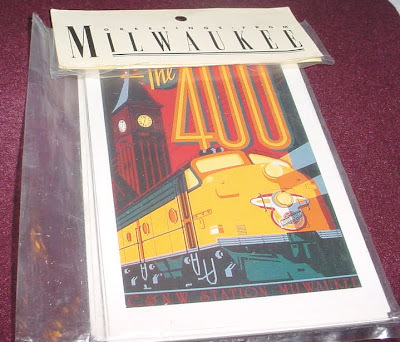 Its a great historical art deco series originally produced starting in 1989 with the Wis Gas co image.Our gallery was the 1st to distribute these and worked closely with the artist.